His brawling, bearish style has won him many fans over the years. On October 15, "Bad News" Bo Kunz enters the competitive arena for what is being touted as his last time. In the main event of SFC 277, Kunz will take on fellow heavyweight Max McNeely in the evening's main event. Kunz (3-2) had a long amateur career fighting at multiple weights. He went pro in 2013 and is coming off a first-round TKO over Kevin Woltkamp. McNeely went 10-4 as an amateur and will be making his pro debut. McNeely's size, youth, and athleticism could give Kunz trouble, especially the longer the bout wears on. Vaunted grappler Ryan Sutton makes his return to competition when he faces Justin Grant in co-main. Grant is susceptible to submissions, which falls into Sutton's favor. Sutton has won two of his last three. Grant has been fighting heavyweight, where he got overpowered often, and is tightening up his lifestyle to drop to 205. We last saw Dewayne Diggs at June's Bellator 157 where he submitted Jason Christeson in the first round via rear naked choke. Diggs trains under Eric Clarkson at River City Warriors. Diggs will face Billy Garris, who is coming off a long layoff, beat Sutton in his pro debut. After taking some time to focus on family life, Garris is looking to get back in the swing of things. A fight that could steal the show will be for the SFC amateur flyweight title when champ Erik Newman faces Kris Craig. Newman (9-2-1) is a talented striker who is tough as nails and hard to finish. Newman has fought a who's who of local flyweights and bantamweights and holds a unanimous decision win over Craig from 2015 for the title. Craig is a power-packed wrestler with explosive takedowns. The 35-year-old Craig is coming off a second-round finish over Shawn McConnell. Kicking off the main card will be welterweights Colin Parr vs. Oscar Ahuatzi. Parr has a strong BJJ game and is coming out of Watson's MMA. The power-packed Ahuatzi is super tough and can weather a storm. 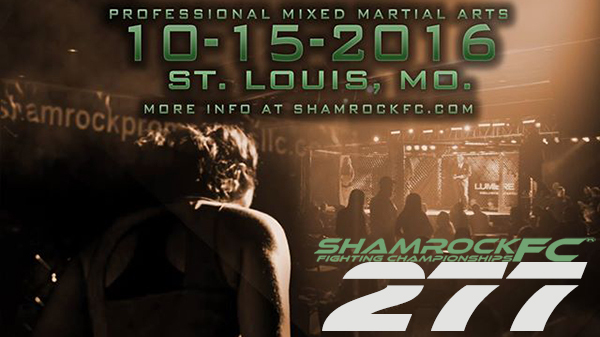 Like all Shamrock FC shows, this event will be streamed live on pay-per-view. For ticket and PPV. Lumiere Casino, St. Louis, Mo.